You can now use your fingerprint, phone’s password or PIN to lock sensitive sections of Paytm app. The updated version of the Paytm Wallet supporting this new feature is already rolling out from the Google Play Store. This is new security feature will restrict access to the Passbook and pay sections of the application. To use the new facility, go ahead and update your Paytm app from the Play Store. 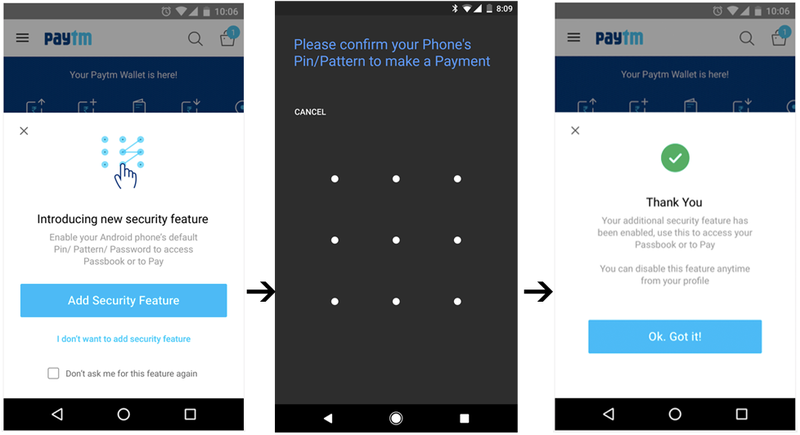 The latest security feature is a much-needed addition as it successfully addresses a significant vulnerability of the Paytm app. However, it may not have any value for advanced users who have already been using their smartphone’s built-in app-lock to secure sensitive applications. For the users who are not so much expert in the Android ecosystem, I am providing a step by step guide on how to use the newly launched feature. 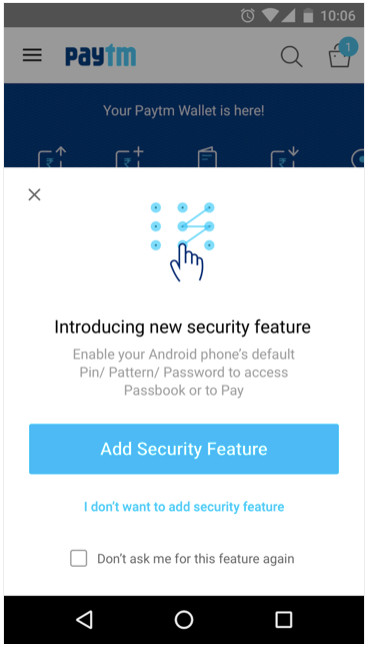 How to use the New Security Feature in your Paytm Wallet App? Please note that to use this new feature, it is mandatory that you already have a lock screen password for your Android device. If you don’t have this, go to Settings > Security > Screen Lock and then choose your desired Screen Lock. You may select any one between PIN, fingerprint, password or pattern to secure your mobile. After you are done with this, proceed through the steps mentioned below to turn on App lock in your Paytm app. Update the Paytm Wallet app and launch it. Then click on Pay or Passbook after which you will see a message asking you to enable this new feature. If you did not log in to Paytm, then you first need to login in order to enable this security lock. Now, click on “Add Security Feature.” You will need to re-enter your phone’s security lock which may be PIN, Pattern, Password or Fingerprint. As soon as you confirm it, your app password of Paytm is set. Click on Pay or Passbook to check if the new security feature is enabled. If you do not want to use this feature and want to disable it, then go to the Profile section of your Paytm app > Security & Settings > Android Security Feature > and Slide it off. You need to enter you’re the PIN/Pattern/Password/Fingerprint again to deactivate it. While the new feature is already operational in Android, Paytm has assured that it’s iPhone counterpart will get it soon.